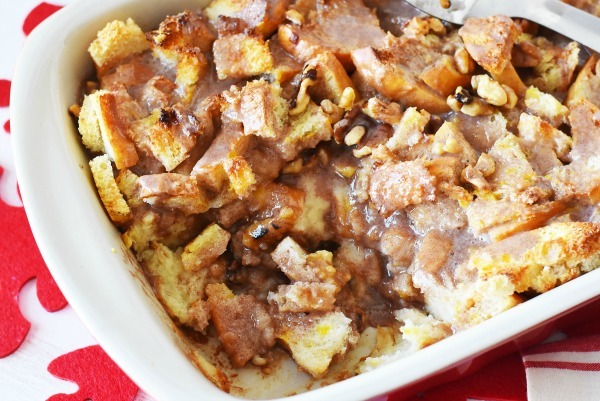 French toast casserole, also known as bread pudding is my husband, and I’s favorite sweet breakfast or brunch meal. My mother in law is actually the one who introduced me to it, and ever since I have always loved it. 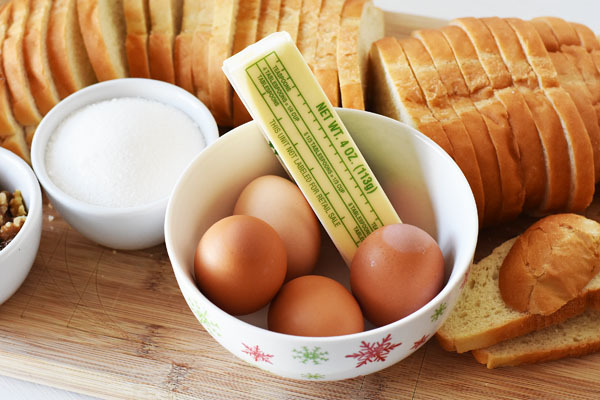 Growing up, my mom and dad would make us french toast on the weekends, but they never made a casserole out of it. Let’s just say 17 years ago, I fell in love with this sweet, warm dessert-like dish. 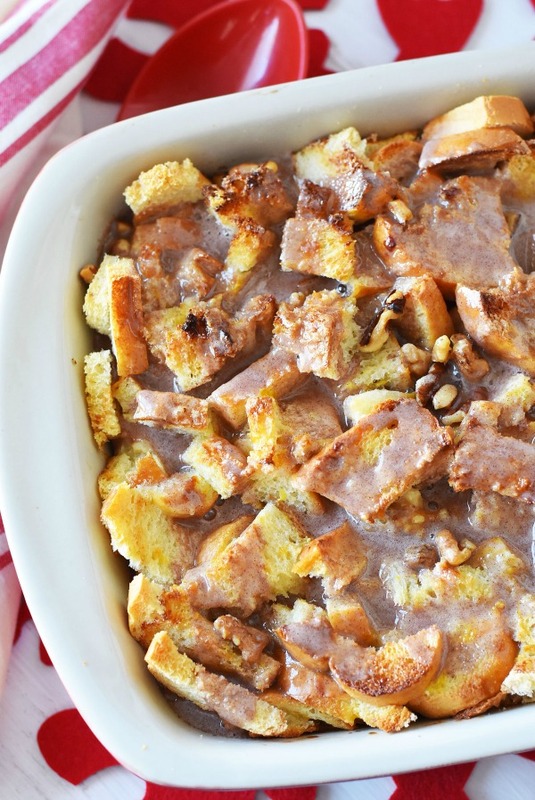 Personally, I love that french toast casserole can be made so many ways! 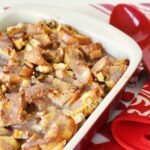 I have been experimenting and concocting several variations as of lately, and this Cinnamon Walnut French Toast Casserole seems to be a top winner! 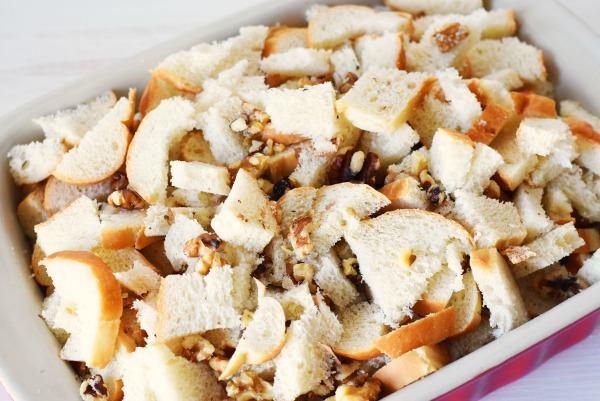 Made with day old french bread, eggs, butter, vanilla, brown sugar, cinnamon, and walnuts; it is the perfect combination. A neat trick I discovered was that instead of mixing the cinnamon in with the custard egg batter, I mixed it together with the confectionery sugar, and milk. I really think this is what makes this recipe so delicious! Thanks to the brown sugar and cinnamon glaze, the walnuts also gets candied, toasted, and simply scrumptious! If you need a pretty easy to make brunch recipe then this is prefect! We will be making this again for Easter and know the kids will be excited! 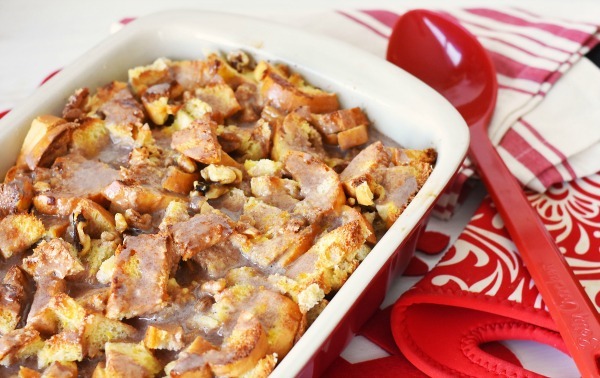 Check out how to make this Cinnamon Walnut French Toast Casserole below! A delicious dessert like breakfast or brunch meals that is perfectly sweet, crunchy, and irresistible. In a bowl, combine the milk, eggs, and vanilla. 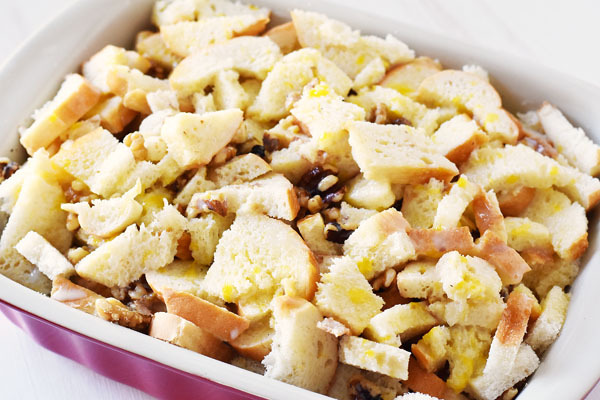 Add cubed french bread to the baking dish. Pour over the custard and make sure to cover all the bread as much as possible. Add the melted butter, and brown sugar to your empty bowl, and mix. Pour over the top of your bread. Sprinkle with nuts. Bake for 30 mins or until center is springy and fully cooked. 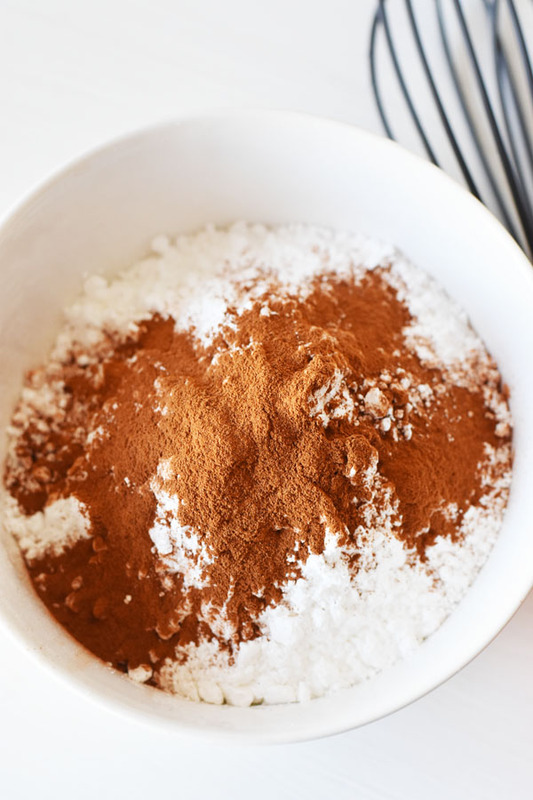 While casserole is baking, in a clean bowl mix your confectioners sugar, cinnamon, and milk until a thick, but pourable consistency occurs- set aside, and pour over your warm casserole once it is done in the oven. I suggest using 1-2 day old french bread. I find white sandwich bread gets too mushy and does not hold the flavor as well as french bread does. THIS is the perfect Sunday morning breakfast! I want to make this for my family this weekend! OH man! I am drooling here! This looks amazing. French toast is my favorite. I’ve never had it this way before. Yum! We are huge fans of french toast here. I will have to make this for brunch on Sunday. My family will love it.